Following the breakdown of their relationship, Ella Gareeva Draper and her ex-partner had been to court more than nine times, as her ex-partner (who cannot be named here due to a 2017 court order) sought to have access to their two children. The mother made a non-molestation order against the father, in order to prevent him contacting her. Unlike a restraining order, a non-molestation order does not require that the person against whom it is directed be found guilty of any offence. Abraham Christie, a man with a long string of criminal charges and convictions to his name, attended a London event sponsored by InfoWars, the conspiracy-pushing online radio network belonging to American Alex Jones. This conference was attended by UK-based conspiracy theorists like Brian Gerrish, Ian R. Crane, and others. Christie, whose earlier gold-trading business had failed, had started a new business in February 2012. At the InfoWars event, he was filmed presenting one of the speakers, Max Keiser, with a one-kilogram ingot of silver, then shouting the name of his new business to the camera. Christie claims to have contacted Gerrish at this event. At a similar event in November 2012, Christie met Finnbarr Hagan, an associate of Gerrish’s. According to the CRIS report which would later record the police investigation, the children were referred to social services because of “concerns over the children being left on their own as being heard crying. At the time Ella did not appear to have a partner”. A witness claims to have seen Ella and the father engaged in a dispute in the McDonalds restaurant in Hampstead. They say that Ella attempted to serve the father with a court application to remove the children from the UK, and that he in turn served her with a court application ensuring that she could not take them. So I go to him and say I’m thinking to move to the south of France….I enquired with solicitors much, much before, you know, what if I wanted to move out of the country, what the steps would be. So I give him a call saying that I’m thinking to do that, you know, and he says no, he’s not going to allow it to happen, so okay, I knew my next step will be, like, to go to court.However, on the 4th of September, I think it was a Friday, the next working day he went and applied for prohibit steps, saying…that I’m trying to take them out of the country….I’ve been abusive to children, and another application he made for the residence of children at that time. During the September 2014 police investigation, police confirmed that the father had applied for full custody of the children at the time when Ella proposed to take them out of the country. The father had contact with his children for the first time since the previous October. The same month that the father had his first access to the children in seven months, Ella Draper met Abraham Christie, whose extensive criminal record includes theft, fraud, drugs, firearms offences, and battery. Abraham is a known child abuser who by his own admission had recently been released from prison. He admitted to having attacked his teen-aged son as recently as mid-May 2014, and his step-daughter has called him “the step-father from hell”, as she had witnessed him beating her younger brother until the child wet himself in terror. Abraham moved into Ella’s house in Hampstead, calling himself the family’s “nutrition advisor”. Abraham Christie became involved in a heated verbal altercation with the staff at Christ Church School, in which he shouted at them that they were “poisoning” the children by allowing them to eat “off-limits” food. The parents at Christ Church Primary School (CCPS) were aware of his presence, describing him as a “foreboding person” who seemed “malevolent and overbearing” when he appeared on the school’s playground.They stated that he did not behave “the way people expected in a playground”. He had on at least two occasions appeared shirtless, and the caretaker had asked him not to do this. Later, the caretaker as well as parents who had asked Abraham to keep his shirt on would be named as “cult members” by Ella and Abe. In early August, Abraham called and left messages for his brother-in-law, Metropolitan Police Special Constable Jean-Clement Yaohirou, saying he had information regarding the abuse of children. At that time, Jean-Clement said, Abe was not offering specific information, but was trying to “give him justification”. Abe claimed that a church, a school in Hampstead, and a police station in Haringey were involved. Jean-Clement asked whether he had evidence, and Abe said he would get some. …the children’s minds were filled with ever more elaborate, fantastical and sexually explicit stories. Over time, more and more detail was supplied to the central core of the fabricated story. ‘Brainstorming’ brought about expanded versions of events. More and more individuals were named as participants within the cult. Venues for abusive activities grew in number, spread across Hampstead and Highgate. Ever more sexually explicit details were woven in to the fabric of the fantasies in an attempt to make the children’s accounts believable and seemingly authentic.By the time the children arrived at the airport for the journey back to England, at Mr Christie’s and Ms Draper’s instigation, they were able to ‘speak to camera’ about the stories concocted during the brainstorming. The obvious purpose of the film clips was to provide ‘proof.’ It was part of a deliberate plan by Mr Christie and Ms Draper. The children do as they are told. They do so forthrightly, without inhibition and with apparent conviction. First thing upon returning to London, either Abraham or Ella called Brian Gerrish, a UK-based conspiracy promoter who runs a YouTube channel called “UK Column” from Plymouth, Devon. They arranged to meet with Gerrish at a later date. Alarmed about what he had heard from the children, Jean-Clement called Scotland Yard the following morning. He gave a copy of the audio recording to a friend for safe-keeping. This friend had looked at the video and recognised one of the parents when they had said the name of one of the parents that they were talking about, and he called up this chap who then took a copy of this video and contacted us. He also contacted, I’m not sure if it was his lawyer or someone, but then we got the copy of that from him. Mrs Justice Pauffley observed that despite the recording’s key importance to the case, it was not reviewed by police until after the investigation had been closed. By suggesting the investigation would have been “directed towards other areas of interest”, she means that Ella and Abraham would have been questioned and possibly charged based on the contents of the Jean-Clement audio recording. Contrary to popular belief, Abraham and Ella did not initially go to the police with their concerns about the children. Rather, the police, alerted by Jean-Clement and the above-named accused parent, went to see them. Abraham and Ella were not happy about this. The family showed concerns about speaking to Police and eventually allowed the officers entry. They spoke to the two children who started to give some graphic disclosures. The meeting was stopped…this disclosure needed to be in ABE format. This was explained to [redacted] and Abraham who did not wish to attend the Police Station without Special Const. Yaohirou present. According to Gerrish, who lives in Devon, he interviewed “the boy” in the “earliest days” of the case, but he does not specify a date. He has claimed that he did not meet the children in person, but spoke to the child by phone. However, Gerrish has admitted to meeting Abraham and Ella “in September”. Glastonbury, meanwhile, is the home of Araya Soma, a friend of Abraham’s via his former girlfriend. It was also the home of Finnbarr Hagan, who Abraham would later identify as a “scout” for Gerrish’s UK Column. Knowing that the police had scheduled a drive-round to enable the children to identify their father’s house and other sites of interest to the investigation, Abe and Ella took the children on a “practice” drive-round by taxi. 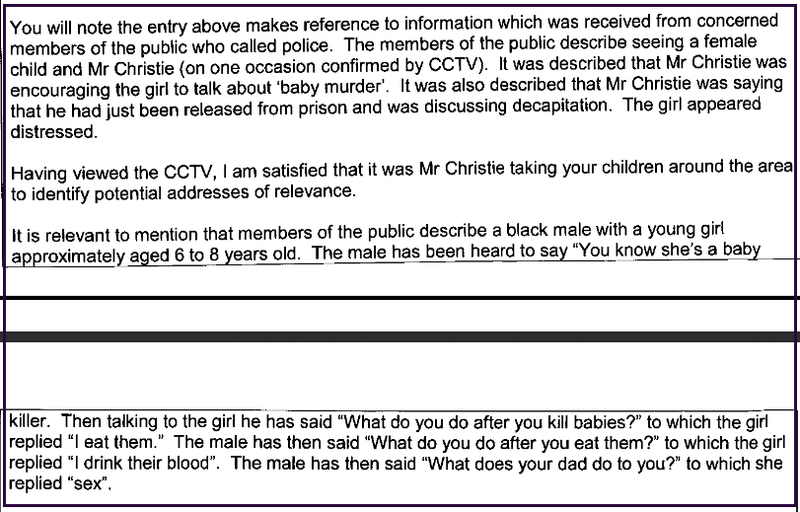 Members of the public reported to police that they had seen a female child and Abraham Christie (on one occasion confirmed by CCTV). Abraham was heard saying that he had just been released from prison and was discussing decapitation. The girl appeared distressed. The girl replied, “I eat them”. Finnbarr Hagan visited Abe and Ella at Ella’s house in Hampstead. While he was there, he talked to the girl, secretly filming their conversation as he did so. He also interviewed the boy briefly. During his attempted interview with the boy, Finnbarr was surprised by an approaching adult whilst audio-recording the children, and shoved his phone into his pocket, still turned on. In doing this, he audio-recorded Abe discussing his concern that DC Steve Martin was involved with this case. Also on 8 September, the police conducted their drive-round with the two children, who had previously stated that they would be able to identify their father’s house in this way. Neither was able to identify his house. The CAIT team received an email from “the informant”—Abraham’s brother-in-law Jean-Clement Yaohirou—which was logged in the CRIS report. This information, Jean-Clement said, had come to him from Ella Draper, and comprised a detailed list of names, places, and alleged cult activities. It begins “Main action is happening in Christchurch (sic) with at least another 10, possibly more schools involved”. On 11 September, following an ABE interview in which the little girl reported that Abraham Christie had hit them and that their mother hadn’t cared and had indeed approved of his abuse of the children, both children were made the subjects of a Police Protection Order (PPO), and were removed from Ella’s custody. The same day, approximately three hours after the children were taken into custody, Abe and Ella emailed Brian Gerrish of the UK Column. At around the time the children were taken into protective custody, Abraham left the UK, possibly fearing arrest. He would not return until February 2015. The father was interviewed by DC Savage, under Caution plus 3. The father said he had been alerted by his children’s social worker that the police were looking for him, and had come in voluntarily. Maloney forwarded it to his friend Jon Wedger, a former police officer with the Metropolitan Police, who in turn sent it to a police contact. Via a somewhat circuitous route it came to the attention of DC Steve Martin, who was involved in investigating the alleged cult in Hampstead. This clarified for police that Abe and Ella were using the children’s story as the basis for a publicity campaign. The police conducted further ABE interviews. The children, who had been away from Abe and Ella for a week by now, had been eager to disclose something in the car on the way to the interview suite, but DC Martin had asked them to wait until their disclosures could be properly conducted and videotaped. Once in the the interview suite, the little girl stated very clearly that everything she had told the police about the alleged cult had been a lie, and that she and her brother had been forced to lie by Abraham. “Abraham’s the whole problem”, she stated, calling him “an idiot”. In addition to waking them in the middle of the night to interrogate them about alleged sexual abuse, they said, he had hit them with spoons. It would emerge during Sabine McNeill’s 2018 trial that Abraham had heated the spoon on the stove before applying it to the little girl’s face. The children told the doctor and psychiatrist that he also kicked them “as hard as he could” in the privates; pushed them into walls until they bled; threatened to bury the little girl alive in the desert; and hit them with a closed fist to the head. He hit the little boy so hard on the head that he ruptured his eardrum; both children reported impaired hearing during their medical exam. Abraham made them kneel in front of him in their underwear, while he poured water on them. The children referred to this as “water torture”. In the videos made en route home from Morocco, both children look tired. Bruising and a cut are visible on the little girl’s face. DC Martin received the email which had been sent by Abe and Ella to Gerrish, who had forwarded it to Maloney, who’d sent it to Wedger, who had sent it to his police contact. The police closed the investigation into the case, classifying it as a non-crime incident. In addition to the children’s retractions of their original statements, various inconsistencies were cited, as well as complete lack of physical evidence in any of the locales named. From the information that we have, the children’s mother is living alone. Believe that Abraham has moved out of the house in order that she can regain custody of the children. There is no indication that the relationship is over. Abraham has circulated video interviews with the children taken while on holiday in Morocco where it is apparent that he has coached the children into disclosure….While in Morocco he has hit the children however the assaults do [not?] constitute an offence in this country suitable for prosecution. The children have indicated that they do not wish to return to the family home and are in fear of Abraham. Based on this I would be concerned for the welfare of the children if returned.Abraham: It is believed that he is circulating videos of interviews of the children giving disclosure to people to raise awareness of the satanic cult. This may continue. …He has convictions for offences against his own children and I would suggest [this may cause] future safeguarding issues with these victims if they returned home. Thus it is clear that prior to the videos going viral in February 2015, Abraham had been sharing copies round. However, they did not go far, and few people at this time were aware of the developing hoax. In an audio conversation released in March 2019, Abraham and Ella discussed how they had planned to release the videos of the children in a controlled fashion. They express anger at Sabine for having released them prematurely, thus spoiling their plan. They mentioned having made plans with “a group”, and having had discussions to which Sabine had not been a party. Given the difficulty Araya claims to have had in recruiting Maloney, it is unlikely that Maloney was part of the original group. Oddly, she claims that Gerrish had refused to help, though Gerrish himself claims that he was involved from the beginning. It is possible that having reviewed Finn Hagan’s videos, he pulled out of the group, but this issue remains somewhat unclear. During her 2018 trial, Sabine McNeill testified that Ella phoned her in 2014, though she does not give the specific date for this first contact. By November 2014, however, Sabine said she had involved herself in Ella’s case. Ella was attempting to have the children returned from protective custody to her care. She was also attempting to convince the police to re-open the case, as she wished to see the father jailed. Ward would later start a blog called Hampstead Research in which she and her partner Jacco de Boer published false allegations against people who were included in Ella’s “witness statement”. Ella sacked, then re-hired, then re-sacked her legal team. They turned over a bundle of materials to her, including the video recordings of the police interviews which DC Martin had conducted with the children in September. Ella had previously approached Sabine McNeill to act as her McKenzie friend in her care proceedings as she tried to regain custody of her children and have the police case against the children’s father re-opened. Now, Sabine and her friend Belinda McKenzie would take over as Ella’s “friendly advisors” in court. Sabine McNeill sent an email to a person named Brad. In the email, titled “How many hours of footage?” she said that she was asking for support. She said she was sharing the videos and wanted to know how to make a trailer for them. She also mentioned having contacted a police officer who she felt would confirm the credibility of the mother’s story. “Russian TV will come on 11 January”, she wrote. “I may persuade Ella to pay for it”. Assisted by Belinda McKenzie, and having lost confidence that Judge Mayer would return her children to her, Ella filed for a judicial review. Judge Mayer transferred the case to Mrs Justice Anna Pauffley. Over Christmas, Ella entrusted Sabine with copies of the videos of the children. During her 2018 trial, Sabine stated that these were on CDs or DVDs. Regarding my social life with meaning, I can only hope that this case will become the breakthrough we’ve been working towards.It took me quite a while to get my head, heart and strategic thinking in line with the necessities to respond to calls for court proceedings in the case of a Russian mum whose two children were taken by Barnet police on 11 September 2015 (sic)”. Now that Sabine had access to the videos and Ella’s “witness statement” as well as other material Ella’s sacked solicitors had given their ex-client, the hoax was ready to go online. While Abraham had made a rather weak attempt at putting the videos online in September, Sabine would make use of her many blogs and contacts, online petition sites, and other social media to spread the word. Mary Rooney, a friend of Sabine’s and a Director of at least one of Belinda’s companies (the former Knight Foundation) was witnessed handing out printed leaflets regarding returning the children to their “Russian Mother” outside Southwark Crown Court. Ella’s care proceedings were still before the courts at the time, and no decision had been made regarding the children. Thus the leaflets were in contempt of court. Four of the videos of P and Q appeared in Sabine’s Google Drive as of this date; more would follow. At approximately this time, Sabine wrote to Barnet councillors, and uploaded links to the videos in her Google Drive as the “most convincing evidence” that they should hand the children back to their mother. According to Sabine’s testimony at her 2018 trial, Barnet Council was the first agency to receive all the videos. High Court judge Mrs Justice Anna Pauffley became involved with the care proceedings. Upon realising that Mrs Justice Pauffley would probably not be returning the two children to their mother, Sabine wrote a Position Statement for Ella to present at her 26 January hearing. Sabine claims that she “accidentally” BCC’d this email, which contained the videos of the children making their initial allegations, to conspiracy blogger Henry Curteis of The Tap Blog. However, during Sabine’s 2018 trial, DC Steve Martin testified that the email to Theresa May contained no bcc field. In the body of the email, Sabine included the following note: “(TAP – watch these two very brave children describing the awful things being done to them by their father and others. If they were on Youtube, they’d go viral. Someone should upload them)”. On or about this date, Sabine also opened a petition on Change.org, titled “The Rt. Hon. Chris Grayling MP: Return the Whistleblower Kids and Abuse Survivors of a London School to Their Russian Family”. The petition contained a link which led to the videos on Sabine’s Google drive. This petition received several thousand signatures before it was removed by Change.org for violating its terms of service. During a contact visit with the children, Ella provided them with pens and paper and asked them to write a letter to the judge saying they wished to return home. Both children refused to do this. Ella was overheard swearing at the children in Russian, and the children appeared upset but still refused to co-operate with her plan. As a result of her behaviour, the local authority chose to suspend contact with the children for seven days. This would be Ella’s last contact with the children. Also on 2 February, an article was published on Henry Curteis’ Tap Blog, titled “Children describe Satanic murders they were forced to take part in”, which contained an email to then-Home Secretary Theresa May, along with a list of, and links to, the original videos of P and Q. As Sabine had predicted in her email to Curteis, the videos quickly went viral, with more than 4 million people having viewed them by 10 March 2015. The Tap Blog post included the videos made by Finnbarr Hagan. The original post has since been removed, but an archived version is available. However, we have chosen not to link to it as it contains the names of children and protected witnesses. In stating that “the attached Position Statement was our offer NOT to expose this scandal in exchange of returning the [two] children”, Sabine was admitting that the story about dozens of children and thousands of babies being victimised by the alleged cult were untrue. If she’d believed the story, there is no way she would have proposed exchanging the lives of two children for the lives of thousands. This statement is an outright attempt to blackmail a judge. This point was raised during Sabine’s 2018 trial, and reiterated by HHJ Sally Cahill QC in her sentencing remarks. A conversation thread called “Child Abuse victims interview” begins on the David Icke Forum. This thread, which begins with a post from a blog called Aangirfan, will eventually surpass 1,000 pages of debate. Parents named by Ella Draper in the written “witness statement” document which she sent to Jean-Clement Yaohirou, Brian Gerrish, and later Sabine, received an email from Christ Church Primary School telling them that unfounded, unpleasant rumours about the school were circulating. However, parents received no further details than this. The parents began to find false allegations online about themselves and their children. This information seemed to be coming primarily from two blogs: Tap NewsWire and Aangirfan. Ella read her “witness statement” aloud on a YouTube video, in which she revealed her false allegations about her children’s school, their teachers, and other pupils and their parents. In this statement she claimed that the headteacher was leading a “Satanist” cult from the school, and that children at the school were being regularly sexually abused. Her statement contained the home addresses, phone numbers, email addresses, and employment information of many of the alleged cult members. It also contained allegations that certain children “enjoyed” being sexually abused. Ella failed to attend court when “mandatory and prohibitory injunctions” were made against her. The court order specified that both she and Sabine were to remove from the internet all material related to the proceedings which were under way. Neither complied. Police came to Ella’s house to question her about her harassment of the father and other parents at Christ Church Primary School. In a recording of this event, Ella and Abraham can both be heard inside the house, as can her parents who were visiting from Russia, and her solicitor, who attempted to negotiate through the letter slot with police. Wishing to avoid arrest, Ella evaded police and fled the country. On 12 February, police officers attended at Ms Draper’s address. Her car was on the driveway. A gentleman spoke with the police through the letter box and indicated that he was the mother’s lawyer.The police explained they were there to discuss possible offences committed under s.4 of the Harassment Act 1997. They were denied entry to the property. Whilst the police were waiting for the means to secure a forced entry, three people climbed out of a first floor window, ran along the roof line of three or four houses and climbed down onto some nearby garages where they disappeared from sight. In an update to her Change.org petition which notified supporters that she had left the country, Sabine said she had taken a plane to Berlin. She stated that she had done this to evade arrest. Following her departure from the UK, Sabine was informed by a person named Chris Alexander that there was an Interpol warrant out for her arrest. Her solicitor confirmed this. Alexander had been introduced to her as a friend of Maurice Kirk, who, like him, owned and flew his own planes. After informing her of the Interpol warrant, he offered to fly Sabine to the Philippines, an offer she refused. Abraham Christie was seen outside the front entrance of the Royal Courts of Justice, as part of a group led by Belinda McKenzie, which was campaigning for the “return of the Whistleblower Kids”. A witness summons was issued requiring his attendance at court to answer questions on February 20. However, attempts to serve the summons were unsuccessful. He later fled to Spain as well. He and Ella lived together in Spain until 2018, when he moved out. He is currently living in Morocco, and continues to attempt to use the Hampstead hoax as a means of promoting his hemp business. In a group Skype conversation, Sabine stated that she planned to release the police videos of the ABE interviews with the children. In the comments section on one of her many blogs, Sabine states her intention to publish the police ABE interviews with the children. In an update on her Change.org petition, Sabine McNeill introduced “this remarkable video” made by a person later identified by the pseudonym “Jacqui Farmer” (later revealed by Hoaxtead Research to be Charlotte Alton Ward). This was the first known Hampstead involvement by Charlotte Ward. Within weeks she would set up the blog Hampstead Research, from which she would engineer a campaign of brutal harassment against those accused of belonging to the alleged cult. Sabine urged readers to “share, share, share”, and said about the Hampstead case, “Once this is over, I can go back to my flat and continue publishing”. In a Change.org update, Sabine urged people to look at the videos of the children, and to “question all the sceptics”. At that time she also said that “extreme situations require extreme actions”. Sabine posted an update to Change.org called “Hampstead horror action plan” suggesting that people paint dolls with red nail polish, attach tags directing people to the Whistleblower Kids blog, and post them to businesses in Hampstead. At Sabine’s 2018 trial, it was stated that Sabine registered the domain for her Whistleblower Kids blog on 15 March 2015. However, Sabine stated that she began publishing on that blog prior to that date. Neither child has been sexually abused by any of the following – [redacted], teachers at Christchurch Primary School Hampstead, the parents of students at that school, the priest at the adjacent church, teachers at any of the Hampstead or Highgate schools, members of the Metropolitan Police, social workers employed by the London Borough of Camden, officers of Cafcass or anyone else mentioned by Ms Draper or Mr Christie. By the time the judgment was handed down, it’s estimated that more than four million people had seen the videos of P and Q. The videos would continue to proliferate across the internet, with no thought given to the impact they could ultimately have on the children, those they named, or their families. Scarlet Scoop started this blog, and began posting material debunking and critiquing material put online by Sabine, Charlotte/Jacqui, and others. In August 2015, after having written more than 1,000 posts, Scarlet would hand over the writing to El Coyote. The blog would become hated and feared by those who promote the Hampstead SRA hoax.